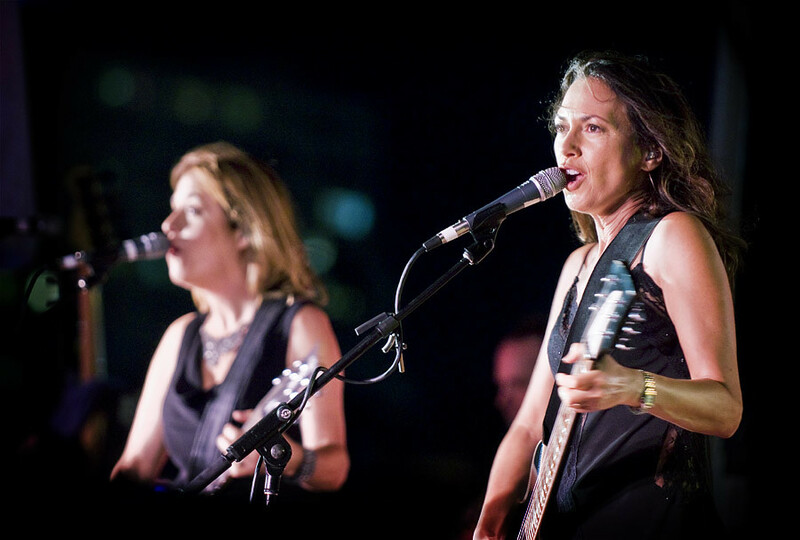 The Bangles' Vicki Peterson and Susanna Hoffs performs on the Santa Monica Pier. On Thursday, thousands of Angelenos made the trek to the Santa Monica Pier for its annual Twilight Dance Series to watch 80's rock legends The Bangles perform a free concert. Now in its 27th year, The Twilight Dance series which is a production of the Santa Monica Pier Restoration Corporation plans to feature high-profile artists from all over the world. 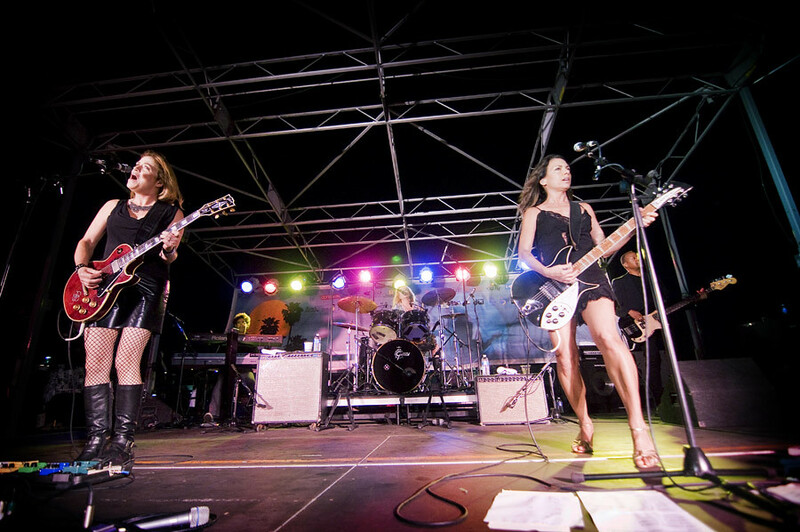 In its second week, it was local favorites The Bangles who grew up a few miles down the road in Brentwood, that brought their pop beats and vocal harmonizing to the thousands who showed for this 80's flashback. The original trio consisting of Susanna Hoffs and sisters Debbi and Vicki Peterson are getting ready to release their upcoming album, "Sweetheart of the Sun" which drops September 13th. They performed two songs off their new album, "Under a Cloud," and the Todd Rundgren cover "Open Your Eyes" while also playing their classic hits, "Walk Like An Egyptian," "Manic Monday," and "Eternal Flame." 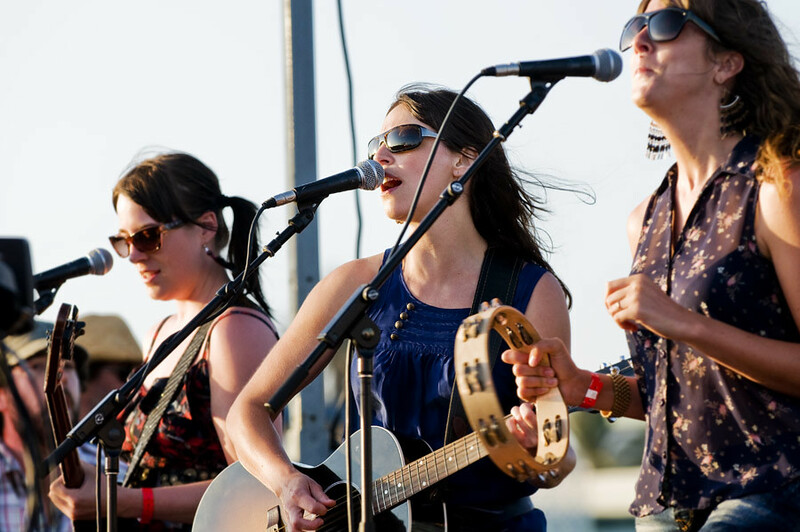 The Bangles performs during The Twilight Dance Series on the Santa Monica Pier. Earlier, with the deck of the pier overflowing with fans still arriving, security had to close the gates in fear of overcrowding and diverted the rest of the fans to the beach where they can watch the concert from a big screen provided by OneWest Bank and the Santa Monica Pier Restoration Corporation. 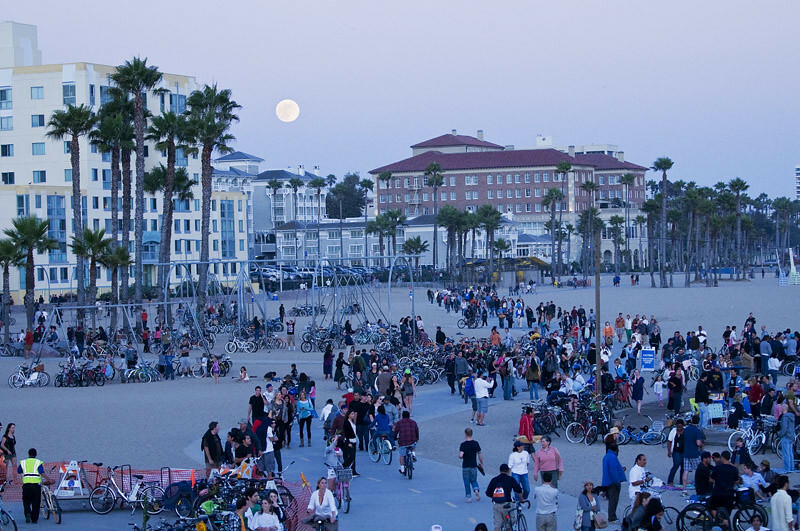 As a full moon rose above the Pier, many brought picnic baskets and cuddled up with loved ones on the beach to relive their 80's nostalgia on a perfect summer night and watched on a big screen. 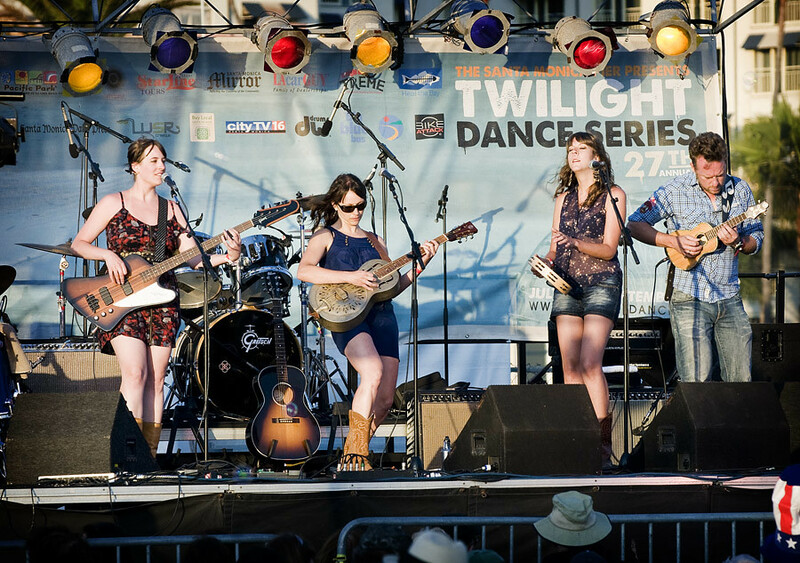 Caracol performs at Santa Monica Pier's "Twilight Dance Series." 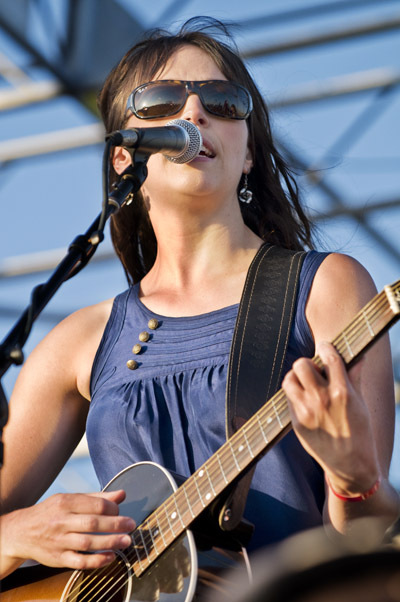 The day began with Canadian singer/songwriter Caracol (aka: Carole Facal) who mixes American Folk with the sunny relaxing sounds of the Caribbean which was perfect for this Santa Monica beach se tting. Her first solo album, "L'arbre aux Parfums," which is written in both French and English, features the raw sounds of the ukulele and autoharp and described as exploring, through her lyrics, a darker side of human emotions and relationships through a no holds-barred expression of anger, love, contempt and arrogance in search of something more. Caracol is currently working on her new album which is expected to be released later this year. But the night belonged to The Bangles who played well into the night kicking off with the guitar shredder "Hazy Shade of Winter" from the 1987 movie "Less Than Zero." While playing songs that covered their four albums including Different Light and Doll Revolution, The Bangles also squeezed in a few covers such as The Turtles' "Outside Chance" and "September Gurls" written by Big Star in 1974 which they recorded in 1995 for a compilation. After playing 18 songs in two hours, the Bangles ended with chart-topper "Walk Like An Egyptian" asking the crowd numbering in the thousands to sing along. While the Bangles turned back the clock for thousands of fans this night, they still look to the future with all new songs and an upcoming album coming out in September that features 10 new tracks. The Bangles perform their new song "Under a Cloud" off their new album Sweetheart of the Sun which drops September 13. XIMENA SARINANA'S NEW VIDEO FOR "DIFFERENT"